Transitionradio.net is a prominent media source that supports those that are Transgender, Transsexual, Cross Dressers, Gender Non-Conforming, Gender Queer, Gender Questioning individuals and Allies. On October 28, 2012 two Trans-people, couple +Mark Angelo and +Jessica Lyn Cummings, took a giant step towards placing Trans-people in control of how they are presented in media, by creating that media source, Transition Radio. On their premiere episode of transition radio TV, they discuss how they met and why they wanted to give a voice to the transgender community. The show quickly became a hit and would become not only Transition Radio but Transition Radio TV, as well. Mark Angelo Cummings, the Trans-man on a mission, as his blog so correctly states, is a man of many talents. A talented singer and musician, with powerful thought provoking lyrics, he captures in song after song the entrapment of a person living not only in the wrong body but a soul living in a world and society in turmoil. No better is this more apparent than in the title single of the CD ‘Enslaved’, with a vocal quality reminiscent of Bob Dylan. Bob Dylan also seems to meet salsa in, ‘I Choose Life’, a positive message of hope and the will to live. If you thought radio and music was the only mediums that’s been touched by Mark Angelo Cummings, think again. He’s appeared in and on many talk shows and documentaries. He’s also an advocate and producer, occupational therapist and owner of Bodies under Construction. However, his most personal career move may have been as author of a touching non-fiction memoir. The story is of his life as a young man struggling with gender identity disorder and where he expresses the ‘gift’ that people transitioning acquire. He has the ability to see both sides of the isle and see the unity and duality in everything. That is certainly something TMP can respect. Fresh Books calls, ‘The Mirror Makes No Sense’, raw and real, a must read. 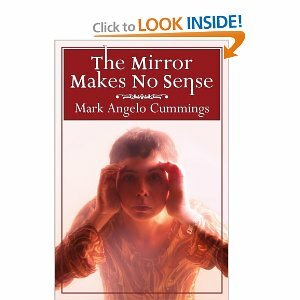 The Mirror Makes No Sense is a helpful tool for parents to deal with children suffering with gender identity issues. Mark Cummings greatest accomplishment though, may have been when he met the ravishingly beautiful Jessica Lyn. She is his fellow Trans-soul that would become his partner in business, as well as in life. Together in the short time since they launched Transition Radio they interviewed the who’s who of Transgender Society; hunk +Buck Angel, the gorgeous and talented +Isis King , rising movie star +Angelica Ross, radio personality +Britney Somers , show girl extraordinaire +Victoria Michaels and the incredibly handsome entrepreneur +Jason Robert Ballard , to name just a few...then...me?? Well then, so on March 8th 2013 I’ve had the honor to be asked to have a chat, live on Transition Radio, with Mark Angelo and Jessica Lyn Cummings. In the short time since I was asked to chat with them on their show, I who believe that to be inspired is to inspire; I truly have been inspired. Not only are they a shining example of perseverance, talent and leadership, but a perfect example of Trans-love, Trans-man and Trans-female, joined together in marriage, business and becoming leaders in Trans-media. They are transitioning all our lives from feeling alone to transitioning us into unity, all on Transition Radio TV. Listen to Mark Angelo and Jessica Lyn Cummings interview of me and TMP live Friday March 8th.